Author Marie Dunham’s newly released “Yeah, Though I Walk… A Journey of Survival and Deliverance” is a tale of self-discovery and search for true love. “Yeah, Though I Walk… A Journey of Survival and Deliverance” from Christian Faith Publishing author Marie Dunham shares the story of a woman who grew up with everything, except love. Through a journey of self-discovery, she will learn to embrace the true love of the Almighty God. “Yeah, Though I Walk… A Journey of Survival and Deliverance”: a tale of self-discovery and search for the true love that can only be found through the Almighty God. “Yeah, Though I Walk… A Journey of Survival and Deliverance” is the creation of published author, Marie Dunham. Marie holds a master's degree from Alvernia University as well as dual certification from the American Institute of Health Care Professionals (AIHCP) in spiritual counseling’s and crisis intervention. Marie also attended and graduated from Rev. Melvin Floyd School of Evangelism and Biblical Studies. She has also received forty-five hours of training from Women Against Abuse. Marie is a member of True United Church where she attends Minister In-training classes under the direction of Dr. Bishop Shawn D. Bartley. Bishop Bartley appointed her to the position of True United’s Spiritual Counselor. Marie's works at COMHAR where she is a recovery counselor, out-patient therapist, and a spiritual counselor. Marie facilitates a spirituality group that is held at COMHAR twice every week. Marie has been a speaker/presenter at Cornerstone Church Women’s Bible Study, AGLOW International, Living Word Church, and Breaking the Silence Women’s Conference. She has also spoken at True United Church on the topic Awareness of Women Abuse (Know the Signs). Independently, Marie conducts individual sessions upon request. Published by Christian Faith Publishing, Marie Dunham’s new book is the author’s personal story of self-discovery. Author Marie Dunham was raised with every necessity of life, except for love. Struggling to overcome the burden of her past and the pain she cannot release, she set out on a journey to discover true love. She knew the way was through God, who is pure love, but she has to discover that for herself. View a synopsis of “Yeah, Though I Walk… A Journey of Survival and Deliverance” on YouTube. Consumers can purchase“Yeah, Though I Walk… A Journey of Survival and Deliverance” at traditional brick & mortar bookstores, or online at Amazon.com, Apple iTunes store, Kobo or Barnes and Noble. 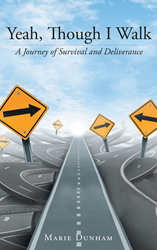 For additional information or inquiries about “Yeah, Though I Walk… A Journey of Survival and Deliverance”, contact the Christian Faith Publishing media department at 866-554-0919.